Approximately 1 in 8 pregnancies end in miscarriage. It’s a startlingly high figure, and I count myself as guiltily fortunate to be excluded from it. But so many of my friends have experienced miscarriage in a variety of ways, at a variety of stages, that despite being daily driven up the wall by my four munchkins, it’s rare that I get to bed without having felt extremely grateful for, and blessed by, their presence in my life. I could tell you stories of early and late miscarriages, babies who died within hours of entering the world, and situations where miscarriages recur, like a horrendous record stuck on a groove of loss. There is variety in how, and when, it happens – but there is little variety in the grief experienced. Whether early or late, young or old, losing a baby can be a traumatic, life-altering event. Mothers’ Day provides a particularly stark reminder of what has been lost, particularly if motherhood is still proving elusive. So I thought this would be an apposite time to share with you a book which might be a comfort and a blessing. 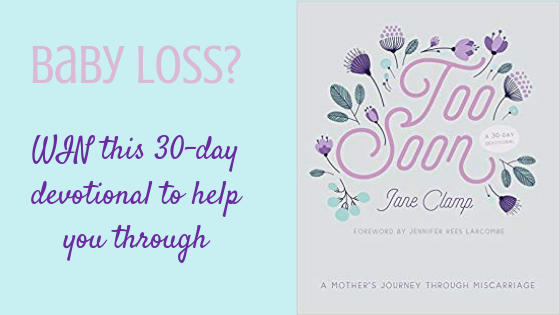 Too Soon is a 30-day devotional for those who have lost a baby. It is, I think, unique in what it seeks to do: comfort, empathise, allow space to think and grieve and pray – while drawing the reader further into God’s presence, using appropriate Bible passages to accompany mourning, rather than to move you out of it. 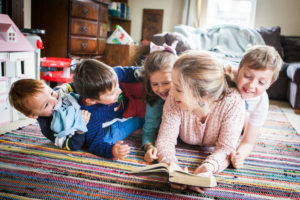 Author Jane Clamp lost four babies in the process of trying to grow her family. Now, a couple of decades on, and with a couple of healthy grown-up sons, she is able to reflect on her experiences as if they were yesterday, yet offer the wise comfort which comes with time and space to grieve. Each day’s reflection starts anecdotally, ponderously, with a reflection that is relevant to the experience of going through the loss of a child – perhaps the difficulty of the question ‘How are you?’, the sense of isolation, or the triggers which come out of nowhere to remind you of how low you’re feeling. Most days include a Bible passage, but this comes towards the end of each day’s reflection, together with a suggested prayer. I don’t mean to sound uncomfortable when mentioning the Bible – personally, I see the Bible as of utmost importance. But in times of difficulty, I’ve found – and maybe you have too – that it’s just hard to open the Bible and let it speak to you. It can be hard to pray too. The fact that Jane does not force the Bible upon you, but carefully selects passages which will gently comfort and draw you towards God, is vitally important. Towards the end of Too Soon, there is a helpful suggested liturgy which you could use in a thanksgiving or memorial service for your baby. I’m not a Christian – will I appreciate this? There is plenty of wisdom in the Bible, so I’m not about to say who will and won’t get something from this book. But if you’re sympathetic to the author’s position of faith, then yes, I think you would appreciate this book. I’m a Dad who lost a baby – is this book for me? The subtitle is ‘A Mother’s Journey Through Miscarriage’, it’s been written by a mother, and the cover is designed in pastels. Nice pastels, but you know – not every man’s cup of tea. If you’re cool with all this then yes, I don’t see any reason why you wouldn’t gain from many of Jane’s reflections. Some are specific to being a woman, having housed a baby and so on, but many speak more generally to those who are mourning a child, and I think men could get a lot from this book too. Perhaps it is something you could read as a couple. This is a superb book which I hope I’ll never have to buy. Sadly, statistics suggest that I’ll be supporting yet more friends with baby loss in the future. When I do, this book will be my gift to them. I have TWO copies of Too Soon to give away – but I’m doing it differently this time. Usually I ask people to comment or sign up to my mailing list – but, being a sensitive topic, people may feel uneasy about commenting. Also, being part of a Christian parenting mailing list may be difficult if you’re still hoping for a child who hasn’t yet been gifted to you. For this reason, my giveaway this time will be focused on social media. To win a copy on Facebook, simply click here to like my page, then share the post which you’ll see pinned to the top. To win a copy on Twitter, simply click here to follow me, then retweet the tweet which I’ve pinned to the top of my feed. The deadline is this Sunday, 31st March, at 8pm GMT.